ROME — The European Space Agency expects to carry out the qualification flight of the Space Rider spaceplane in 2021 followed by multiple demonstration missions before handing over the program to industry, according to Lucia Linares, head of ESA space transportation strategy and policy. Speaking at the PhiWeek, a five-day conference focusing on the future of Earth observation taking place Nov. 12-16 at the ESA Centre for Earth Observation (ESRIN) in Frascati, Italy, Linares said the private sector showed a lot of interest in the spaceplane during a recent Space Rider workshop. Space Rider, a continuation of ESA’s Intermediate Experimental Vehicle (IXV), which flew in space in 2015, will be able to carry up to 800 kilograms of payload for orbital missions lasting as long as two months. The platform would allow payload to be exposed to microgravity and the space environment for a longer period, after which it would be returned to the Earth. “We plan to have a number of demonstration missions to demonstrate a range of capabilities – in orbit demonstration and validation, defense and security applications and, of course, commercial opportunities,” Linares said. 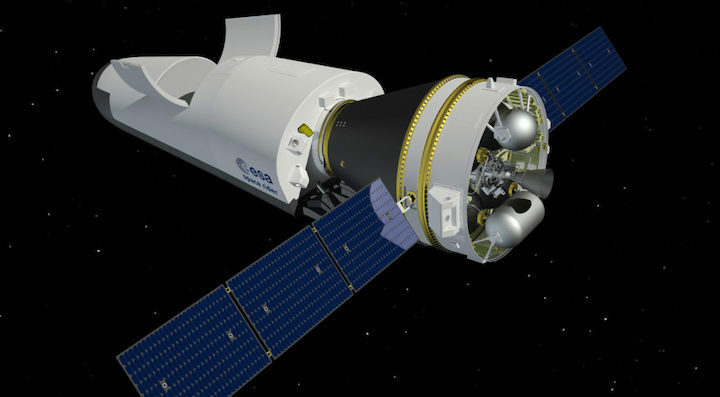 Linares also said that ESA and its partner Arianespace are readying for a proof-of-concept flight of the Small Spacecraft Mission Service, which is set to take place in early 2019. The mission will test a new smallsat dispenser aboard the Vega rocket, Arianespace’s smallest launcher. Linares said that after issuing an announcement of opportunities for the demonstration in 2017, the agency received an overwhelming response mostly from the commercial industry. “We received numerous proposals: 71 responses, 166 spacecraft, of which only 30 are institutional,” Linares said. Linares added that ESA prioritized missions focused on Earth observation to fly on the demo flight. The agency, she said, is also looking to support commercial micro-launcher developments, in line with the vision of the ESA Director General Jan Woerner, who sees ESA’s role in what he calls the Space 4.0 era as an enabler of private endeavors rather than the dominant funder or lead implementer of projects. “We want to move with this paradigm to follow the request of commercial actors in Europe and when they have an idea privately funded, which they believe in, then ESA should be there to support them to build in competitiveness in Europe,” Linares said.